So, you cooked a huge ham for your festive dinner and now you have tons leftover. Am I right? This happens all the time, especially if you only have 4 or 5 people at your holiday table. What do you do? You find other ham recipes, of course, that's what you do! My Mom used to say that ham is perfect because you can have it at any meal: breakfast, lunch, or dinner. You can have ham steaks and eggs for breakfast, you can make ham sandwiches for lunch, and you can serve it with Pineapple Stuffing and a green vegetable for dinner. You can also do ham salad, add it to a Breakfast Casserole, or fill an omelet with diced ham and some shredded cheddar cheese. The possibilities are endless. Another great thing to make is soup. Ham and Bean Soup is one of my faves, and if you have a ham bone, then CLEARLY you should make my Mom's Vegetable Soup. Here's a hearty casserole that's yummy and simple. It's SO warm and comforting. Not only that, you can adjust the amounts depending on how much leftover ham you have. Wash and peel (optional) potatoes and cut into enough thin slices to measure about 4 cups. Heat 3 tablespoons butter/butter in saucepan over low heat until melted; stir in flour, salt and pepper. Cover over low heat, stirring constantly, until mixture is smooth and bubbly; remove from heat; stir in milk. Heat to boiling again, stirring constantly; boil and stir about 1 minute. Arrange potatoes in greased 2 quart casserole in layers, topping each layer with desired amount of onion, white sauce and cubed ham. Dot top layer with 1 tablespoon butter. Cover and bake for 30 minutes. Uncover and bake for about 45 minutes longer or until the potatoes are tender. Let stand 5-10 minutes before serving. 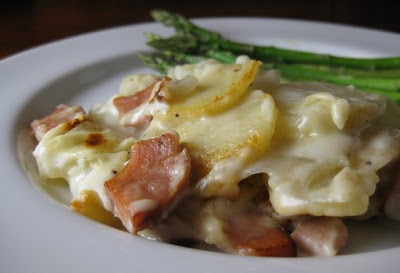 You could easily add your favorite cheese to the casserole, if you like. Either add it to the milk mixture (which would make a cheese sauce), or sprinkle some across the top just before baking. If you're pressed for time, partially cook the potatoes for a few minutes in the microwave before slicing and layering them in the casserole.